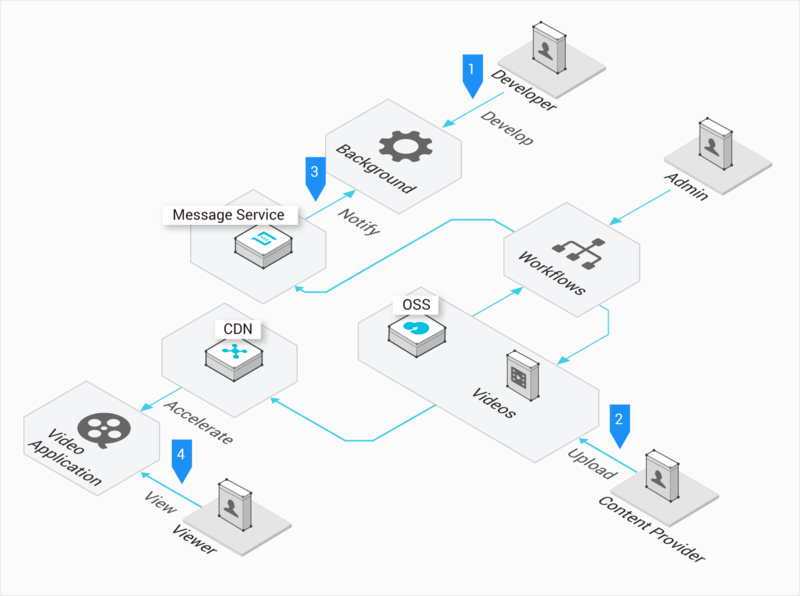 You can use content delivery network (CDN) to deliver content to users from the nodes that are nearest to them, accelerating the response to user requests and increasing the response rate. CDN also resolves the delivery latency problem that is usually caused by distribution, bandwidth, and server performance issues. CDN has been applied in multiple scenarios, including site acceleration, on-demand streaming, and live streaming. Supports a response time of less than several milliseconds, intelligent connection selection, and a backbone network with 10-GE NICs and SSD storage to ensure the smoothness of content delivery. Supports multiple native features, including horizontal service scaling, customizable console, multiple APIs, and simple architecture scaling. Supports Pay-As-You-Go and other billing methods to achieve cost effective and high quality content delivery. Provides a reliable enterprise-level acceleration service over HTTPS, to prevent hijacking, tampering, and leakage. 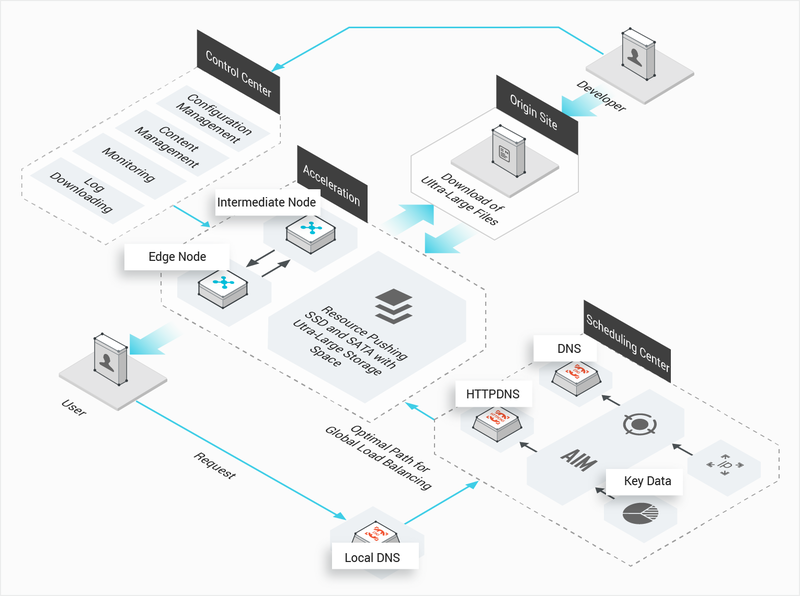 Uses HTTPS to secure client access, node interconnectivity, and origin fetch requests. To achieve secured acceleration, you only need to enable secured acceleration and upload the domain certificate or private key. You can also view, enable, disable, and edit domain certificates. Domain name-based site acceleration works with HTTPS-secured acceleration to support force redirection of HTTP requests to HTTPS. Supports intelligent popularity calculation and hierarchical caching of frequently requested resources. This enables you to precisely accelerate the resources that the users have requested. Supports load balancing among multiple vCPUs, efficient memory usage and management, and maximized input and output operations per second (IOPS) and throughput of SSD storage. All nodes are configured with SSDs to support high-speed reading and writing to greatly reduce response time and increase availability. User-defined expiration rules for cached resources. This feature allows you to apply the rules to a /test/... path or a .html file. Provides multiple parameters for customizing the header of HTTP requests. Supports multiple anti-leech features based on HTTP referer, user agent (UA) headers, IP addresses, and URL authentication verification. Provides a referer whitelist and blacklist to identify and filter visitors and limit access to resources. Supports an advanced anti-leech feature. This feature allows you to use authentication keys to encrypt URLs and protect resources on user origin sites. Blacklisted IP addresses are not allowed to access accelerated domains. Supports web page optimization and smart compression to reduce the overhead of content delivery and accelerate the delivery. Compresses static content files to efficiently reduce the size of content to be delivered. Origin fetching removes parameters following the question mark (?) in URLs to increase the hit rate of the cache and improve the efficiency of content delivery. Supports comprehensive data statistics, multi-dimensional analysis, and user profiling to boost business development. Provides a customized log service and storage persistence service for the ease of log downloading and analysis. Supports smart recognition of illicit content based on deep learning to minimize the risk of user violations. Supports automatic migration of cache hotspots with a response time of less than several milliseconds. Bursts of user requests on a website increases the downlink bandwidth consumption, overloads the server, and results in a slow response time. CDN has provided more than 1,300 worldwide nodes and an intelligent scheduling system. This enables the users to access a myriad of static resources cached on nearby nodes. Spends less on downlink bandwidth than dedicated bandwidth to offload the bandwidth overhead on origin sites. 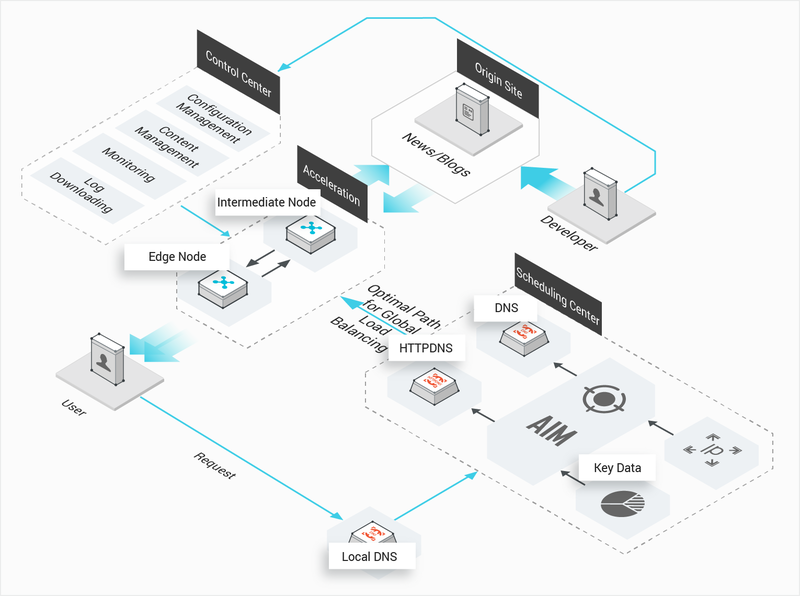 Adopts the distributed system architecture and provides high-performance Alibaba Cloud caching software to achieve high stability and efficiency. Supports real-time and comprehensive monitoring based on domain names and supports intelligent scheduling based on services. Accelerates downloading and the delivery of large files and on-demand streaming. Large files include MP4 file, FLV files, and files that are larger than 20 MB. CDN acceleration works with Object Storage Service (OSS) to save 66.7% of origin fetching costs. Integrates video and audio uploading, automatic transcoding, and media resource management to provide an all-in-one acceleration solution for on-demand streaming. 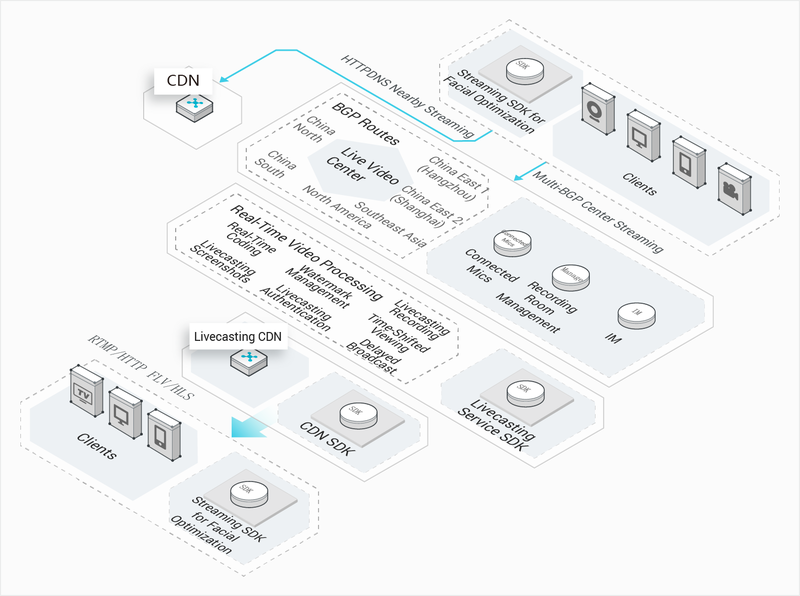 CDN also helps you build a secure, elastic, and highly customizable on-demand streaming platform or application. Supports user-defined video and audio processing workflows to save 20% of bandwidth costs, including visualized configuration of transcoding, screen capture, and watermarks, and narrowband HD transcoding. Supports HTTP referer blacklist and whitelist and advanced URL authentication to completely prevent leeches. Provides stability and high performance with a cache hit rate higher than 95% and a response time of less than several milliseconds. CDN includes an industry-leading content access and delivery network, and the distributed real-time transcoding technology, to build a live streaming platform. 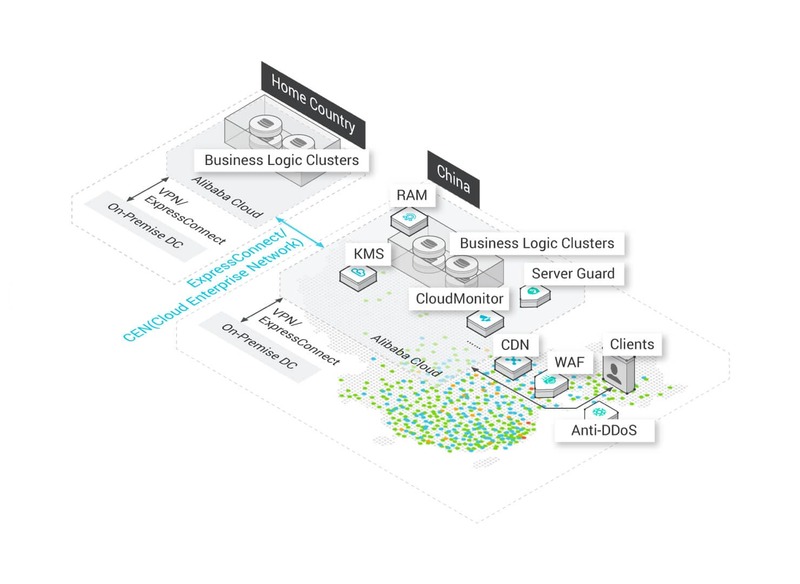 CDN also offers an all-in-one acceleration solution for media resource storage, segment-based transcoding, access authentication, and content delivery. Works with Auto Scaling to quickly adjust the server bandwidth and handle burst traffic. Works with Media Transcoding Service (MTS) to achieve high-speed, stable, and parallel transcoding. This allows you to seamlessly execute multiple transcoding tasks. Caches groups of pictures (GOPs) of frames on CDN edge nodes. This allows mobile playback clients to buffer the content. Compatibility with multiple platforms for smooth mobile network experience. Accelerates the delivery of mobile app update files (apk files) and pictures, pages, small video files, and user-generated content (UGC) in mobile apps. CDN also supports HTTPDNS service for DNS hijacking prevention and precise DNS address resolution. Works with HTTPDNS to implement intelligent and precise routing. This allows users to quickly access nearby resources. Provides iOS and Android SDKs, deeply optimizes multiple protocols, and supports connection multiplexing and request header compression. Supports the acceleration of both static and dynamic content and highly-efficient caching of static content.